It has been 22 years since the U.S. Congress acknowledged vaccine injuries and deaths by passing the National Childhood Vaccine Injury Act and 17 years since the Institute of Medicine first confirmed that vaccines can cause brain and immune system dysfunction while admitting there were significant "gaps" in scientific knowledge about vaccine risks. After nearly three decades of resisting public calls from parents of vaccine injured children for a formal investigation into vaccine safety, the U.S. Department of Health and Human Services (DHHS) has established the National Vaccine Advisory Committee Working Group on Vaccine Safety to review a scientific research agenda proposed by DHHS. On April 11, government health officials invited a few parents to Capitol Hill in Washington, D.C. to participate on a public engagement panel followed by a one hour public comment period. It was both business as usual and a departure of business as usual that left this participant wondering if it was really a new day and hoping is was not just an old day dressed up in new clothes. The draft recommendations of the Scientific Agenda created by the Immunization Safety Office (ISO) was not released to the public until 9 a.m. on April 11 so parents attending the meeting did not have time to critique and tailor remarks made during the afternoon public engagement panel and public comment session. However, the informed public critical of vaccine safety did make a number of important suggestions. As the first panel participant from the public to speak, I gave a presentation on vaccine safety research priorities summarizing past and current public calls to investigate vaccine risks and proposed a "20-year study that prospectively enrolls and compares the health outcomes of two groups of children, one group who will be vaccinated with the CDC recommended 48 doses of 14 vaccines by age six and 60 doses of 16 vaccines by age 12 versus another group, who will remain unvaccinated." Another panel participant, Peter Bell, of Autism Speaks, described his son's regression into autism. While making it clear he is strongly pro-vaccine, Peter gave an eloquent plea for credible scientific research into vaccine safety issues and asked Committee members and government officials to "not demonize parents who are asking questions and searching for answers" to outstanding questions about vaccine risks. Another presentation from panel members who were supposed to be representing the public was given by attorney Lisa Randall of Voices for Vaccines. She criticized the inclusion of "activists" critical of vaccine safety who "do not represent the mainstream" public opinion and said that she does not want her children to be in the same room with unvaccinated children whose parents have not "stepped up to the plate" and vaccinated them. At public comment time vaccine safety advocate Kelli Ann Davis, who had worked to press government officials to increase public participation in the meeting, questioned where the funding for Vaccines for Children came from and called for SafeMinds board member Mark Blaxill, who was co-author with me of the 2004 White Paper "From Safety Last to Children First" (http://www.ageofautism.com/ .com and http://www.nvic.org/) to be appointed to the NVAC Working Group. Former pediatric ICU nurse and attorney Terry Poling, whose daughter Hannah was recently awarded uncontested federal compensation under the National Childhood Vaccine Injury Act of 1986 after receiving nine vaccines on one day and regressing into autism, asked the Committee to conduct research to identify biological high risk markers for vaccine-related regression. Terry said that Hannah's development of mitochondrial dysfunction following vaccination could be a clue as to why some children are more vulnerable to vaccination than other children. NVIC Director of Patient Safety, Vicky Debold, PhD, RN, who recently founded Children's Health & Safety Research, LLC, described her son's regression into autism after receiving seven vaccines on one day. 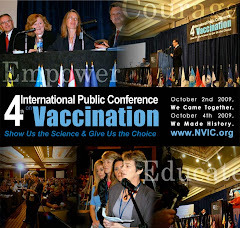 Among the patient safety areas she defined were the "failure to rescue" which, in the case of vaccines policy "would be the pervasive failure on the part of nurses and physicians to recognize the importance of challenge-rechallenge phenomena and to modify the vaccination schedule accordingly. This is how my son was injured and is crucial to minimizing future risk." SafeMinds board member Jim Moody, JD, commented that a lack of credible scientific studies demonstrating vaccine safety makes the application of one-size-fits-all vaccine policies on the entire child population an uncontrolled "scientific experiment." Journalist David Kirby, author of "Evidence of Harm" warned the Committee members that "history will judge each and every one of you. A year from now, five years from now, ten years from now people like me will look back on the history of vaccine safety in this country and look at you folks and say: "What did they do?" Attorney Patty Healy, who was a former biotech scientist and is NVIC's Director of Counseling, told the Committee that when she became a new Mom eight years ago, she looked at the science for vaccine proof of safety and found it so lacking in substance that she made the difficult decision not to vaccinate her daughter. Patty challenged the Committee to be dedicated to investigating and embracing the truth about vaccine safety no matter what it may be. "Show me the science" she said and "let the chips fall where they may." Committee Chair Andy Pavia, MD, and the Committee members listened attentively to the public panel members presentations and to the parents who spoke during the public comment time. Several Committee members, including consumer member Tawny Buck, who has a DPT vaccine injured daughter, asked questions of government health officials and made comments indicating that there is a heightened interest in conducting well designed scientific studies examining vaccine injuries and deaths. Only time will tell if the meeting on Capitol Hill last Friday was for real or for show. Three decades is long enough to wait for government to listen to the people and take action to find out the truth about vaccine risks so every child in America has the opportunity to grow up healthy. In what can only be described as a brilliant turn last night on Larry King Live, young celebrity Mom Jenny McCarthy stood her ground with a defiant "anecdotal evidence IS scientific evidence" in calling on the American Academy of Pediatrics (AAP) to back away from one- size-fits-all vaccine policies that recommend all babies get dozens of doses of vaccines. Describing what happened to her son, who suffered convulsions and nearly died after a round of vaccinations and then regressed into autism, Jenny was accompanied by her pediatrician, Jay Gordon, M.D., and journalist David Kirby in a face-off with AAP pediatricians Harvey Karp, M.D. and David Tayloe, Jr. M.D.. It was a ground- breaking television debate about vaccine risks that highlighted the soft underbelly of a medical community unwilling to deal with the reality that regressive autism is part of the vaccine injury spectrum. Watching Jenny talk about how she recovered her son from autism using diet and alternative healing therapies while resolutely rejecting the tired old platitudes offered up by the two pediatricians trying to defend the indefensible vaccine schedule promoted by the AAP, I smiled as I remembered how it was when I was a young Mom in the 1980's and 1990's and debated doctors on TV. Those were the days when the vast majority of Americans had no idea vaccines could brain injure children and the U.S. media was often bullied by AAP and CDC officials into downplaying reports by mothers that their children died or were brain damaged after vaccination. The AAP and CDC leadership have essentially joined with the pharmaceutical industry and stuck their heads in the sand for three decades, refusing to take action even though parents and a few courageous doctors have repeatedly come to the table at the CDC, FDA, NIH and Institute of Medicine and pleaded with them to responsibly investigate the clear pattern of regression into poor health after vaccination that so many children are suffering. 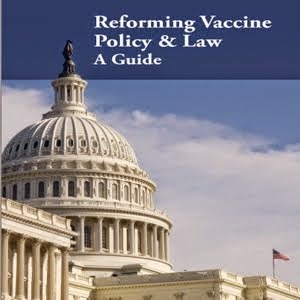 Pediatricians and vaccine manufacturers have hidden behind the protection offered by the National Childhood Vaccine Injury Act of 1986, which Congress gave to them as a gift in an exchange that was supposed to make the vaccine system safer and more trustworthy. The sad truth is that the public trust has been betrayed by those operating a mass vaccination system now crumbling precisely because there was a refusal to listen to the calls by mothers of vaccine injured children to take constructive action in the 1980's and 1990's. Today, those responsible for the betrayal of the public trust will be forced to deal with a new generation of Moms, exemplified by Jenny McCarthy, who are not starting from ground zero like we did. These Moms are holding their broken children in their arms and looking back in anger and disgust at the long, tragic history of denials by those operating the mass vaccination system. This generation of mothers and fathers, many of whom will spend a lifetime trying to heal their vaccine injured children, are standing on a platform of knowledge built brick by brick by those who have gone before and shouting: "It ends here and now with me." During the Larry King show, Jenny announced that she and Jim Carrey will be leading a march for autism awareness in Washington, D.C. on June 4.